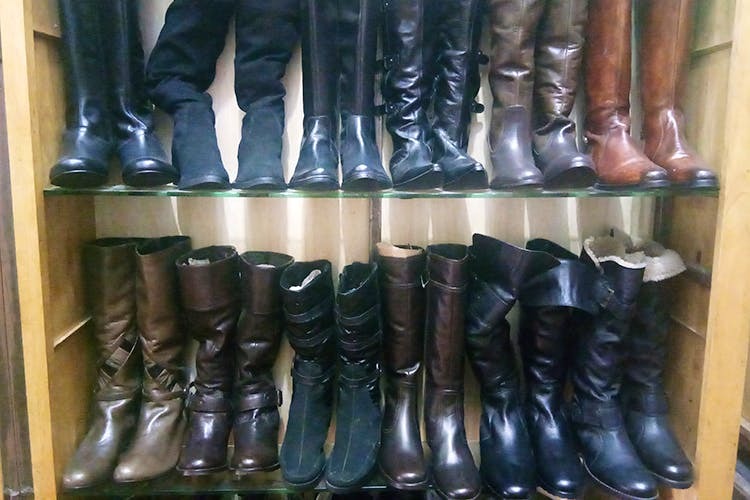 From ankle-length to thigh-high boots — Fashion Land in Kammanahalli will sort you out. Boys, they also stock a range of dress shoes that you can pick from. Kammanahalli’s Ganesha Temple Road is a budget shopper’s paradise. You can find shops hawking everything from trendy sandals to fashionable outfits. Sitting amongst them is the little-known Fashion Land that specialises in boots for both men and women. Beginning at about INR 1,800 and going up to INR 4,500, you can find boots in a bunch of styles and they are crafted from leather, suede, synthetics and everything in between. For the ladies, there are ankle-length suede boots with fringe details or thigh-high ones with buckles. You can also pick up shiny, lace-ups or the classic Chelsea style. Men, you too get plenty to choose from. There are stately-looking riding boots and outdoor boots that come in a range of colours. If you are feeling particularly dressy, they even have boots with floral prints and ones that play around with textures. An entire wing, at Fashion Land, is dedicated to formal shoes for men. You can get the tried and tested styles in the basic hues like black and brown. You can snap up shoes in greens, blues, and maroons too.